For those who likes it black. This tube sat in a fixture in a underpass. The starter was stuck propably for years leaving the tube in the incandescent mode. Wow talk about blackened is the end! How did the ballast make out ? Surprisingly the ballast survived so far, only the white paint discoloured a bit. Undoubtedly it had a hard live to wreak the tube to this state but it still runs now a new lamp in a corniche fixture. Jan 12, 2019 at 02:21 AM Author: Max. Such degree of end blackening is quite impressive! How often do you maintain those underpass luminaires in your city? In our city I shedule the replacements every two years for fixtures with TLM lamps and every three years for those with T8 lamps. These two lamps are from a third-party municipality owned underpass were we do the maintenance under contract and since the tube next to the dead one was still working I did not open the vandal proof fixture till the second one reached end of life. Jan 12, 2019 at 02:48 AM Author: Max. I see, thanks for the details Michael. 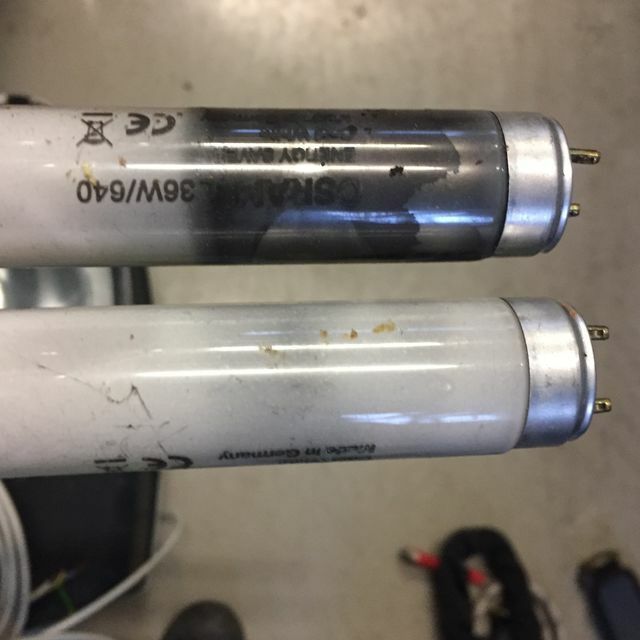 In my city (Eindhoven) they have longer maintenance cycles as they use Philips's TLD Xtreme tubes (and their Aura LongLife equivalent some years ago). We decided to keep the maintenace period short because of the dirt which is collected in some old fixtures blocking some light. In never underpass lights like the Zumtobel Tubilux we do have 4 years periods. The Aura lamps I’ve seen only on trainstations/ and platforms. Is this filament still intact? It would be interesting to leave it for some years more in incandescent mode! The ballast will burn if the lamp left long with a stuck starter. Not always, as you clearly see in this case! Most of these lights where I work tends to hammered until it looses its vacuum since they are electronic ballast which doesn't use the preheating mode. Was it in 24/7 service or did it have a photo control ? These were running on photo control. The thing is that I’m doing the maintenance for the village’s streetlighting now for about 6 years but it was the first time I went to the underpass to replace these tubes. So they are a way longer in use than 4 years. The blackened one did not glow anymore but the other did - with a stuck starter as well. 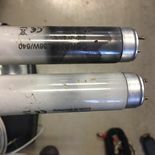 I must admit both have very good ballasts as they did not burn out yet in this condition.